Candice: So D day is nearly upon us. Phil and I will be hanging out with the Shakespearean lovies on Thursday and doing out bit to talk about the trials and tribulations of writing a book at Stratford Literary Festival. To be honest even the thought of it makes me fell slightly sick. I don’t mind getting up in front of audience to talk. Over the years I’ve done a lot of drama and presentations and once I get going I’m fine. But is the build up I hate. Thursday morning I will be a wreak and am trying to fill it with other things so I don’t think about it all. By the time 2.55pm comes about I’ll probably be being sick in the loo. Saturday night I was watching RSLive. It was a brilliant show celebrating 400 years of the Bard with a raft of stars showing how many ways he has influenced people, from Duke Ellington to Cole Porter. It was very clever in showing us the breadth of Shakespeare’s catalogue and its not all the boring text that you had to study at school. However, the show went on for a few hours and as the actors came on to do their bit one of the things I thought of was, ‘they must get nervous waiting in the wings’. Lets face it, does Dame Judi Dench still get stage fright? But I have learnt over time that sometimes adrenaline does you good. I have literally been throwing up back stage before going on to do a play, and then once I am on stage I can remember every line because I need the adrenaline to help me. Luckily, Thursday is more off the cuff but we have our cue cards ready and have planned a talk that we hope people will find interesting. Roll on 3.30pm and I can relax with a cuppa. And if you are coming don’t hesitate to come and talk to us after, when I’ll be feeling much more chipper! Candice: I watched an interesting program last night on Christmas singles. There is a big thing in the UK about getting a Christmas number one. Some have been very successful with it over the years and managed to record a Christmas hit which is still being bought and played 30 years plus later. A few years ago a had the pleasure of meeting Noddy Holder, the man behind “It’s Christmas” in of the most well-known and well sold Christmas records ever ‘Merry Christmas Everybody’. 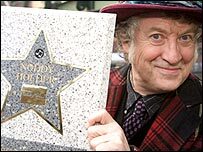 Noddy had been presented with a star on the Walk of Stars in Birmingham, the West Midlands equivalent to Hollywood Boulevard (though with less hookers). We coupled his celebration with one of the Christmas events happening in the city, and nearly caused a riot. Noddy knew exactly what that record had done for him, he called it his ‘retirement fund’. And he was happy to pose for photos and shout that famous line as many times as we wanted him to. Watching this show it demonstrated how the Christmas single had actually been a very clever ploy for certain bands and record companies. This is before the days of X Factor where Simon Cowell just uses it to line his pockets. Jona Lewie’s ‘Stop the Calvary’ wasn’t written to be a Christmas song but by including that one line about, “…wish I could be home for Christmas”. tipped it into that favoured slot. The same can be said for films, ‘Elf’, ‘Home Alone’, even ‘Die Hard’ have a Christmas connection, meaning they get bought year on year. Phil: This is the first blog post I’ve written whilst wearing a new pair of glasses. It’s very exciting. Anyway, this time, there is an extra consideration. After my Aussie trip I’d wondered if some sunglasses might be a good idea. Then an advert planted the idea that some reactor lights lenses that automatically change would be a good idea. I love a bit of technology and don’t relish carrying glasses, a spare pare of glasses AND sunglasses around. Fortunately, I discussed the idea with the optician and we hit a snag. You see, when I’m in the studio filming for a DVD, the bright lights in there will set off the lenses so I’ll be facing the camera looking a bit like Bono and no-one wants that. How did being a celebrity become so difficult? Will there be other things like this to trip us up in our inexorable rise to A-list status? You can laugh but just remember, when you watch Nativity on BBC2 Saturday December 20th at 4.45pm, La Nolan didn’t dominate the scene with Pam Ferris and the chocolate fountain without some serious hair dressing! Candice : I’ve been hanging out with the rich and famous this week. I’ve met a few celebs over the years due my different jobs and you can draw a lot of similarities between them and their lifestyles. The people I have met have come from very different celebrity sets – from one hit wonders to long term famous. Interestingly its often the one hit wonders (or reality celebs) who are the worst for thinking the world owes them a favour (Leona Lewis, any one?) Rather than the jobbing acts who have been around for years are much more aware of the fickle nature of celebrity and acknowledge what their place in the world means. Noddy Holder was lovely, completely aware that he pulled a blinder when he wrote ‘Merry Xmas Everybody’ and quite happy to shout ‘Merry Christmas’ very loudly for all and sundry. The chaps I was hanging around with this week have also been around since the ’70’s: The Wurzels. For those of you who don’t know them, they specialise in a type of music called ‘Scrumpy and Western’. They hail from the west country and have been around for years as a comedy act, parodying main stream tracks. They were helping me out with promoting something for my current job and we did have a laugh as they tried to lip sync over and over again to the version of the track we had written. It made me think about how Phil and I will be when we get our slot at the limelight. For years I’ve been on the periphery with my dabbling in TV work (another interesting bunch, the more famous the actor, the nicer they are) but this is our chance to be front and centre. I’ll have a rider of course – free Mulberry handbag at each venue, LK Bennett shoes etc. And I’ll be wanting my hair and make up done. I do love it when I get that done when I do a period drama. Phil, well I think he’ll be taking lots of photos (I’ve seen his Flicker account since going to Oz) but I’m not sure if he’ll want to be in too many, being shy. But he has got previous of interviews and TV so he’ll probably be more comfortable in front of the camera than me, as I am usually playing a character. Rider, I’m not sure, muffins, tea and a railway magazine perhaps? This time next year, perhaps we’ll be able to answer that question. What would be on yours?